You are an event-driven or communication agency and wish to provide an interactive, original digital solution. Interactive Wall enables you to host company events, organise a street marketing campaign, animate an outdoor sporting event, to modernise a corporate convention, or to organise a selfie contest. 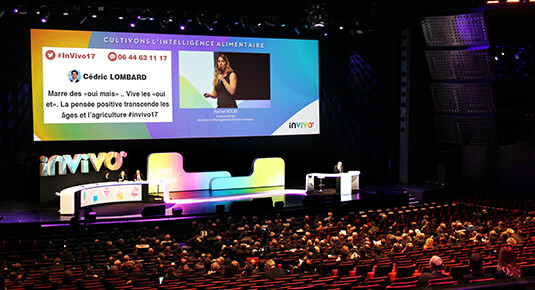 Interactive Wall hosting makes it possible to receive and post your participants’ messages live during an event (seminar, convention, team building). Your guests send messages (texts, photo) on their smartphones by SMS on a free number or social networks Twitter and Instagram with the hashtag of your choice. Our solution stands out with its simplicity of startup and complete customisation. You can set up an interactive wall for your events in less than 5 minutes. You can keep participation private with SMSWall (company receptions, congresses or general meetings) or make it public on social networks with Tweet Wall and InstagramWall (interactive marketing campaign). Our technological solutions, tailored to event marketing, facilitate interactive project design. The design of your wall is completely personalisable and adapts to your imagination, with the charter of your event or your company (graphics, typographics, colours). According to your projects, choose artistic, corporate or fun and original animation. The selected graphics will orient your guests' participation and creativity. You can also decide to let our team of Graphic Designers create your composition. They will adapt to your requirements according to the communications media of your event. Premium account : receive Twitter, Instagram and SMS messages, with a private number dedicated to your event. Then, retrieve the best moments of your party through your online guestbook. Custom account : you can rely on the experience and expertise of our Graphic Designers, take advantage of advice and custom service (telephone support). Our event management agency accompanies you in your event management communications. We offer interactivity for your event organisation and references you can trust. As an event agency, how can you make your social wall a success ?